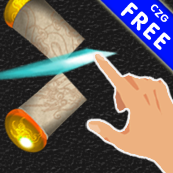 Swipe your finger to slice things in half, tap the screen to throw ninja stars. It's that easy and a ton of fun. Can you top the leaderboards? Can you get to level 10? You must slice all the way through things for it to count. Good luck. Swipe and Tap. Swipe your finger like that fruity slicing game, tap your finger to throw those ninja stars. This game has it both. Intense Fun. This game has you coming back for more with its rich graphics and great fun. Global Leaderboards. Getting to lvl 10 is tough, getting to the top of the leaderboards is the real challenge!